As a business owner, your time is precious, budget is limited, and your hands are always full with a thousand different things. Currently, you have a website and are running ads in the local newspaper, but you know it’s not enough in today’s digital world. 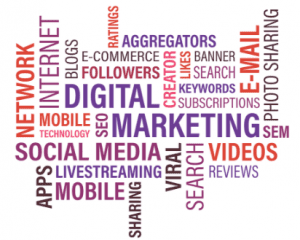 In order for your small business to be competitive in your respective industry, you need to utilize digital marketing. By hiring a qualified and reputable digital marketing agency, you will gain an entire team focused on your goals and objectives without the additional salaries and benefits to your payroll. As easy as it is to hire a digital marketing firm, you can just as easily fire them if they’re not performing to your standards. You pay for performance. Simple as that. You will have more time to focus on your area of expertise. There are a lot of facets involved in digital marketing as you can see in the word cloud below. You don’t have the time to learn it all, let alone manage it effectively and efficiently. You will quickly become overwhelmed. Hiring a certified partner agency with the likes of Google, Bing, Hootsuite, and Big Commerce, you won’t have to waste time training employees. An agency will allow you to hit the ground running as you and the agency focus on the areas of expertise you each possess. Digital marketing helps level the playing field. Done properly, it allows you to reallocate your marketing investment and target the audience you want to reach more efficiently. An agency will utilize their expertise and experience and be able to show exactly what is working and what’s not via analytics. The best practices large corporations use are the same ones an agency will (or should) be using. Let them use their expertise so you can use yours. The fact is, many companies are still not utilizing digital marketing, so there is a real opportunity to grow quickly. This is especially true when you can eliminate the learning curve and hire a certified partner agency right from the start. They live and breathe SEO, PPC, email marketing, social media, click-through rates, and conversion rates. An agency understands that your success is essential for their success and ultimate survival. That is a rather big motivation, wouldn’t you say? So you’ve waiting long enough, hire a certified partner agency before your competition does. For more information about our digital marketing services, leave a comment below or call us for a free consultation! It really helped when you mentioned how the digital market is always changing and how you need to keep up with all these changes in order to have a great marketing campaign. I understand that taking the time to understand this and to assess how your industry works can help you come up with the best strategy to promote your business. Personally, I would want to take the time to consult with a professional in digital marketing to make sure the strategy I choose is customized for my needs and can be successful with the audiences I want to reach. Such a great article, DaBrian. The blog is very informative and mind blowing for small business to get motivate to use digital marketing. Thank you for sharing your important information.